Find them around the great NYC! You can follow them on twitter to see where they’re parked. 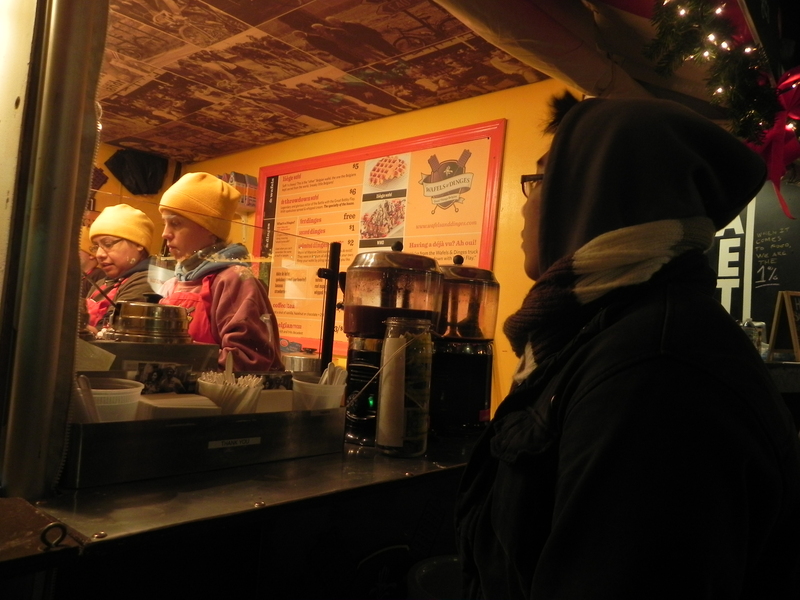 This winter wasn’t the first time Vic and I had these waffles. 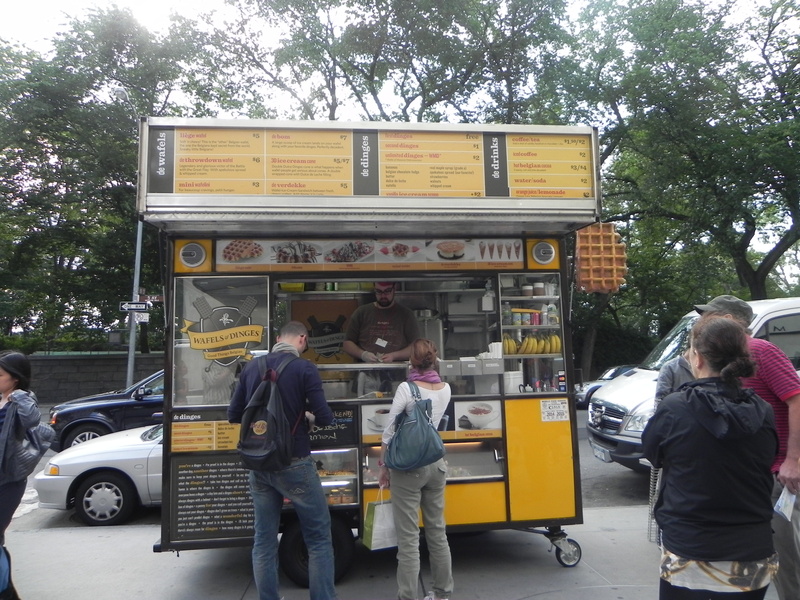 We set our teeth into their waffle back last summer in front of the Guggenheim, we…fell…in love. If you have heard the hype, do not deny it! The hype lives up to its level. 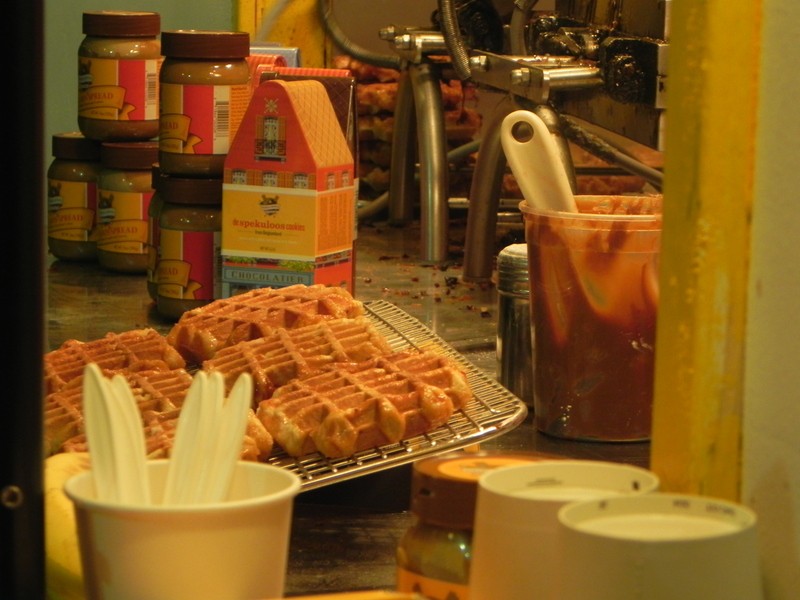 Previously, we had de Bom which was one of their waffles topped with vanilla ice cream (that they made themselves) and the hard-shell chocolate sauce! Awesome and yet so simple! I don’t understand their magic! 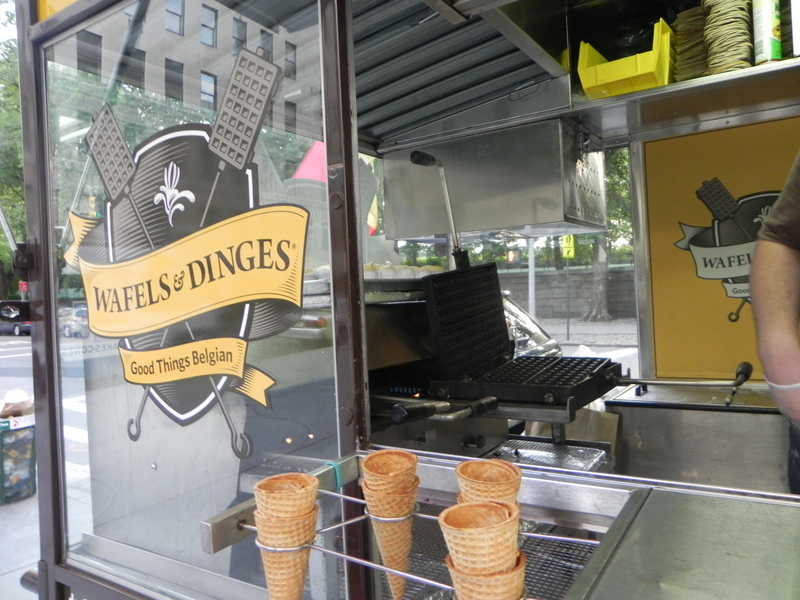 To this day, I still don’t know what a dinge is, but whatever it is, it is most certainly delicious. However, I must say, I do prefer its summer-counterpart more than its winter half. 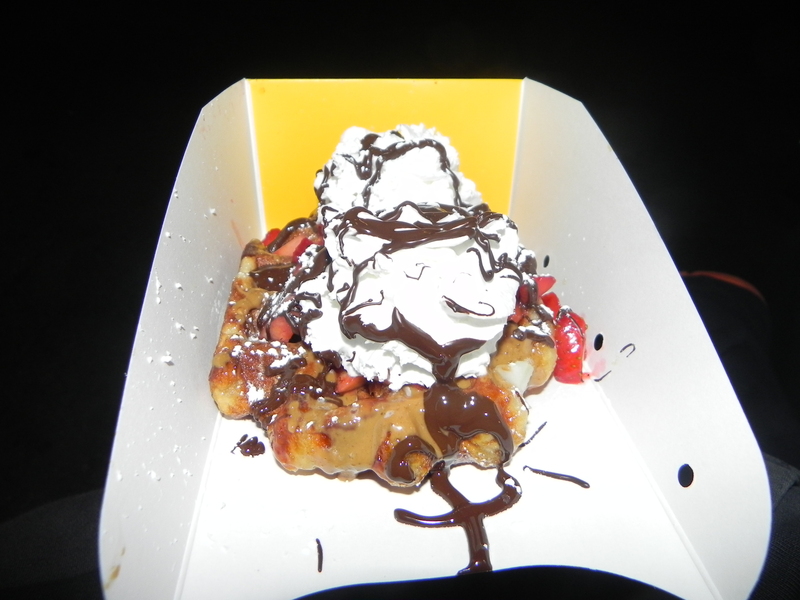 In the summer, you get a scoop of ice cream on top of your waffle with whatever toppings you desire. During the winter, it’s just whipped cream. I guess people wouldn’t want ice cream in the winter anyways. 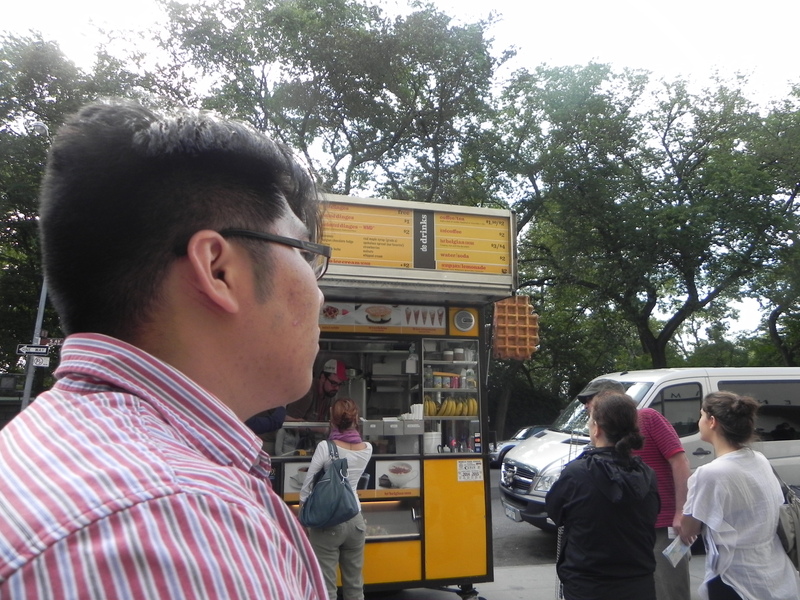 Nevertheless, both times I had the waffle, they were exceptionally well. 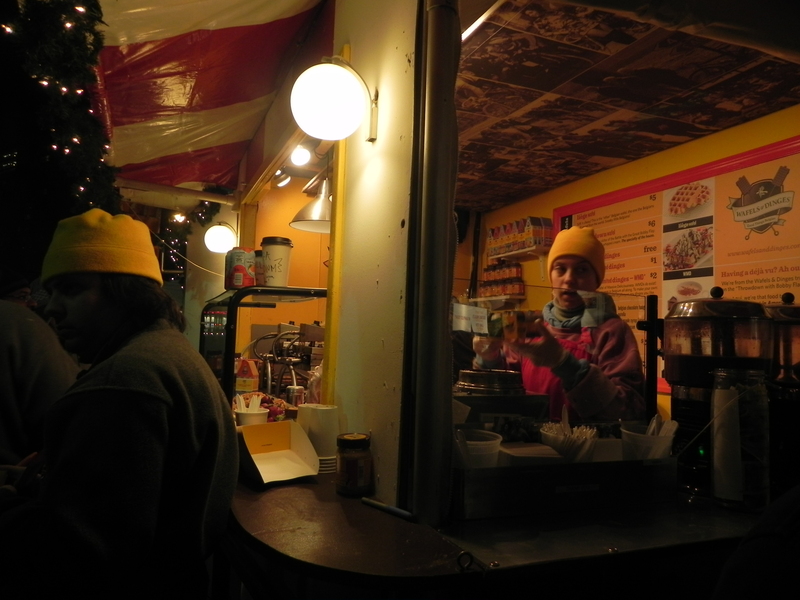 Here’s a short little story: when we went to the waffle stand in the winter, the guy advertising said we were the last customers. We just couldn’t resist. Later on, he told that to 10 other customers. 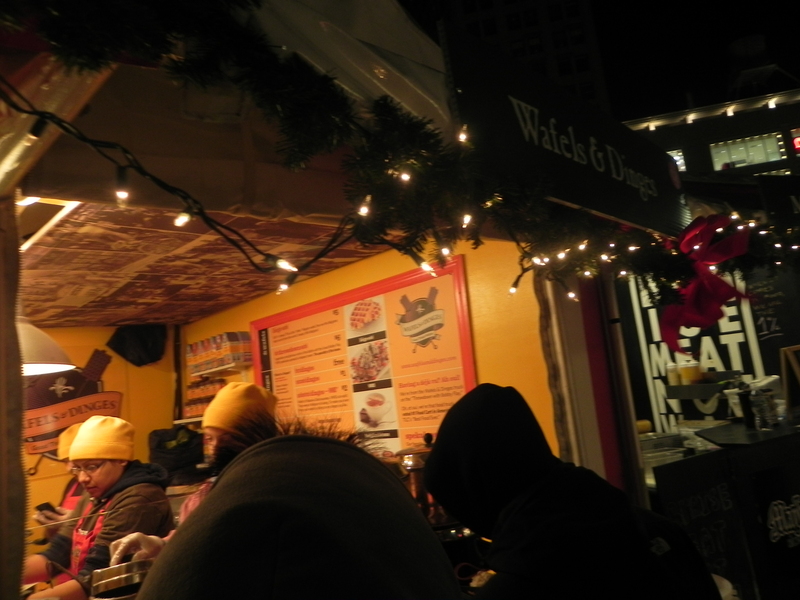 The waffles were baked freshly in griddles right in front of us, so when we got them, it was warm and toasty. 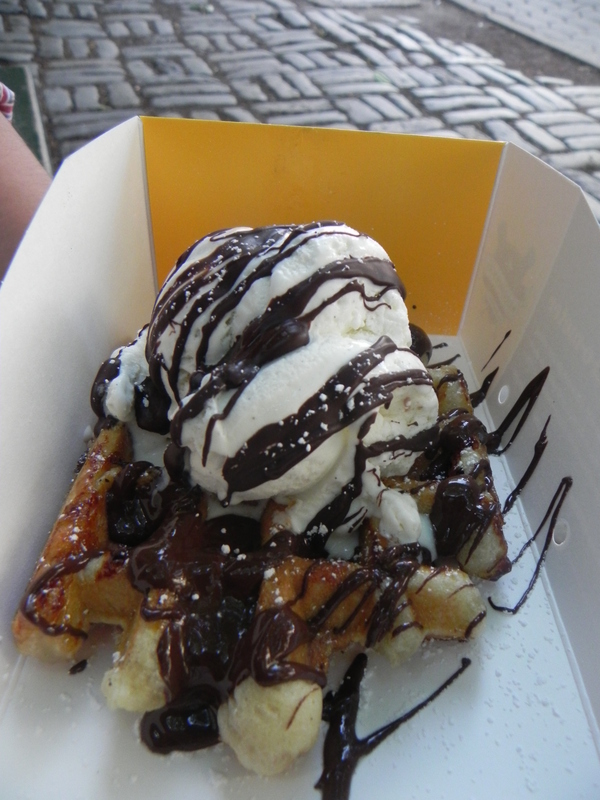 The chocolate sauce they used was creamy and solidified after touching the ice cream or being exposed to winter air. The fruits were fresh. Can’t really go wrong here. I would definitely give it a try. 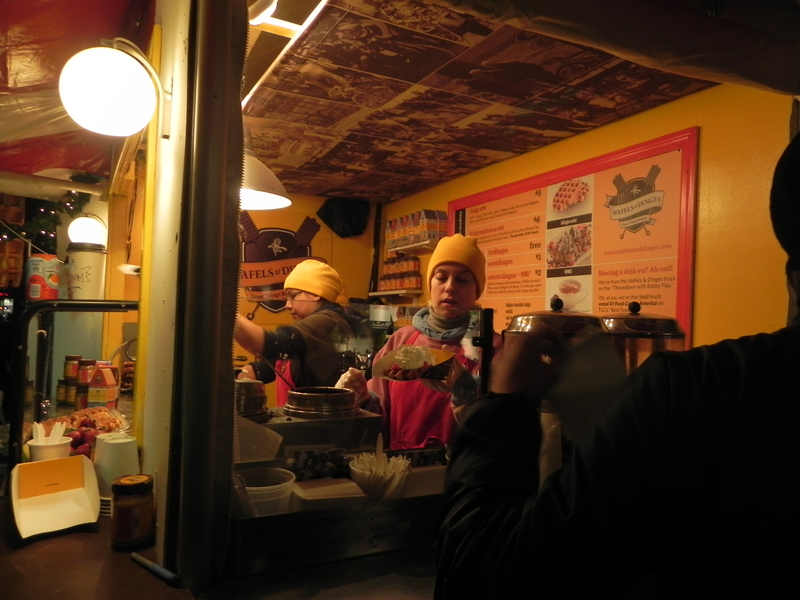 I know Pinky absolutely loves this place and we’ll probably be getting more if we run into one of their food trucks randomly. These waffles have magic in them. Even when I’m a poor college student I am very willing to splurge on these waffles. 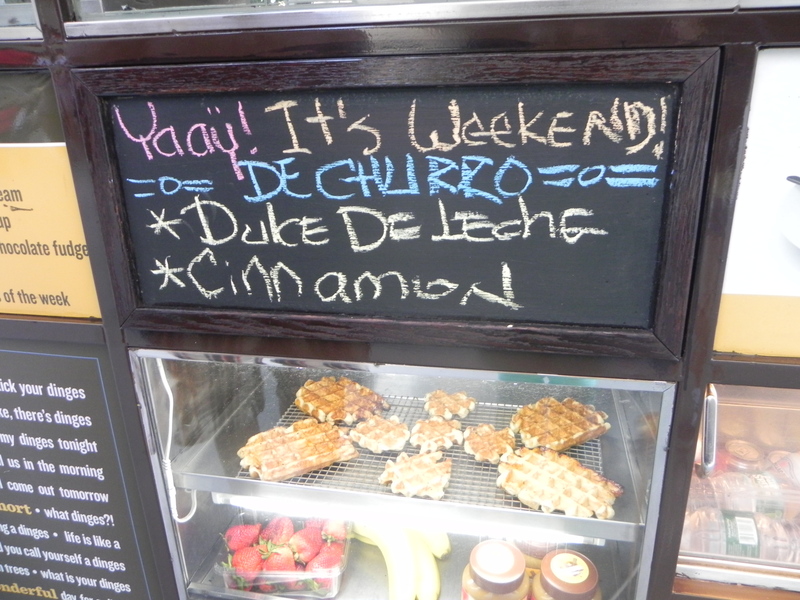 Since I go to school all the way in Long Island, I now and then have these cravings for these delicious waffles. Yes, it’s that good that I dream about them. Their sweetness doesn’t overwhelm the toppings. The one we had with the ice cream was a lot better though. For some reason, we couldn’t find it on the menu…probably because it’s winter time they don’t do ice cream? Anyways, whipped cream was just as good :]. It is the best dessert ever…or even a snack…or get 5 of them, to make a meal. Don’t think that I won’t do that one day! 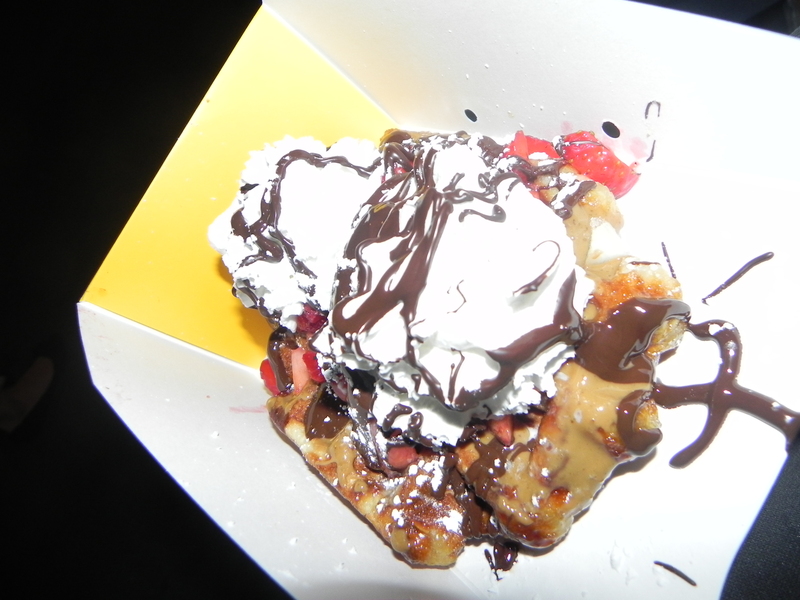 Posted on January 6, 2013 January 6, 2013 by Mr. VictorPosted in manhattan, New YorkTagged belgian, dessert, dinges, food truck, ice cream, strawberry, traveler, twitter, vanilla, waffel, waffles.